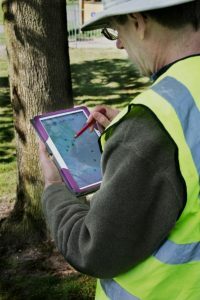 For Professional Tree Inspection, Basic Tree Inspection and BS5837 courses (1 to 5 days), OTISS can be used to provide trainees with a modern, mobile survey system to carry out the practical aspects of the course; to record measurements and observations while inspecting the trees. An important part of all tree inspection courses is to get out of the classroom and stand in front of some trees. Attendees need to put the theory into practice: they need to measure; to observe; and to record. Typically, they are given pen and paper survey forms to fill in, but a more modern approach would be to use handheld tablets (provided by the trainer) with state-of-the art survey software. The tutors use the OTISS website to setup one or more survey sites and customise some survey forms appropriate for each course (e.g. Basic Inspection, Professional Inspection, ISA, etc.). They select what data fields appear on the form; decide which ones are optional and which are mandatory; configure all dropdown and pick lists as required. This one-off setup provides an unchanging baseline for the tutors to use over and over again. For the practical part of the course, the tutor hands out some (low cost) Android tablets with the OTISS survey apps installed. The tutor can guide the students through the few simple steps to show the list of pre-plotted trees and bring up the survey form. The students then use these tablets to record their measurements and observations while inspecting the trees. Back in the classroom, the tutor typically leads a discussion about the results. The attendees can refer to the data and observations on their tablets. When the course is finished, the tutor will collect all the tablets and remove the completed surveys from each one. The system is now ready to be used again on the next course. In addition to Tree Inspection theory and practice, your courses are also providing experience in using modern data collection techniques. This is an online service, there is no software to install or maintain on your PCs. Training Providers pay an annual subscription for the use of the system. All prices are exclusive of VAT. Please allow one working day from time of purchase until the subscription is activated on OTISS. Allow up to ‘n’ course attendees to use OTISS as part of training courses throughout the year. Unlimited use of all the Tree Safety, Risk Assessment and BS5837 features (surveys, maps, PDF reports, Excel, CAD/DXF downloads). 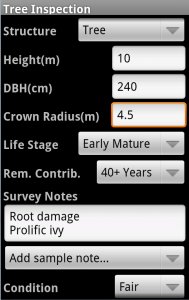 Unlimited use of the TreeSafety Survey, BS5837 Survey Android applications. Up to a maximum of 100 trees per survey type. Includes 1 Gbytes of photo storage. Tablets n/a OTISS does not sell phones, tablets or phone contracts – you can get them at the usual phone and electronic retail places. This section provides the details of how OTISS would be used by Training Providers once they have paid their subscriptions. An OTISS Training Provider account provides you with a single administration login account (for setting up all your courses) and a set of trainee/student accounts. Typically a separate OTISS ‘estate’ is created for each type of course that you run. E.g. one for Professional Tree Inspection, another of Basic Tree Inspection. This allows you to configure the estate, survey forms and pre-plotted trees as appropriate for each course. The training provider also needs to purchase some low cost, Android tablets from the usual retail outlets (we don’t sell the tablets). They install the OTISS Tree Survey and BS5837 Survey apps, and login to each with one of the trainee/student accounts. Most training centres will have two or three good locations that are nearby and have some ‘interesting’ trees. They typically select which site to use each day, depending on the weather and the level of experience of the course attendees. On OTISS, these can be setup as separate sites, each with a baseline survey and some pre-plotted trees. You can assign each tree a reference/tag number, species and maybe a photo, but no other data. The reference tags/species are useful during classroom discussions. The tutor would customise an appropriate survey form (e.g. for Basic Inspection, Professional Inspection, ISA, QTRA, THREATS, etc.). They select what data fields appear on the form; decide which ones are optional and which are mandatory; configure all dropdown and pick lists as required. The baseline survey(s) can then be marked as ‘Closed’ to prevent any further changes. A separate ‘coursework’ survey is created for each of the above sites, and all the trainee/student accounts are assigned to it. This survey’s status is set to ‘Authenticated’, which makes it easier for the tutor/students to create/remove surveys on the tablet as required. Its useful to put the icons for the OTISS survey apps in a prominent position on the tablet’s main page. This one-off setup provides an unchanging baseline for the tutors to use over and over again. But don’t worry, we’ll quickly help you through this setup period. The tutor should check each tablet prior to each course. Check tablet is working normally and its battery is charged. Remove all previous surveys from the tablet. Goto Downloaded Surveys, select each survey and Remove Survey. Create/download the appropriate survey for the course (Basic, Professional, ISA, BS5837, etc). Use Check Online, select the survey and then Create Survey (requires Wifi). This downloads the pre-plotted trees, photos and the survey form. For the practical tree inspection parts of the course, the tutor hands the Android tablets. They only need the following commands to get the students working. Get the students to open the survey app and press the Downloaded Surveys menu option. This shows the survey(s) to use. Select the survey and press List of items to see the pre-plotted trees. Select a tree and press View/Edit item to bring up the survey form. Pressing the ‘save’ icon on the top menu bar, or pressing the tablet’s ‘BACK’ button will save the data they have entered. Note: the other OTISS survey features using maps, GPS and syncing the results to the OTISS server are not required when using the survey apps in this way. These commands should be ignored. Back in the classroom the tutor tyically leads a discussion about the results. The attendees can refer to the data on their tablets. Please contact us if you want to go into more detail about the practicalities of using OTISS for your courses.